Our oldest daughter used to order an open faced roast beef sandwich any chance she could get. Once we went vegetarian and eventually vegan, it was a dish she often mentioned missing. While it was not something I ever craved, I decided I would try to make a vegan version of an open faced roast beef sandwich that would hopefully satisfy her craving. Although the jackfruit does not mimic the usual thinly sliced beef, the flavor is rich and convincing. This recipe takes a while to cook, but the prep time is fairly short. So if you are hanging around the house on a weekend, you can easily prep a batch of this vegan roast jackfruit, and let it cook while you go along your merry way! I add red wine to this recipe and it truly makes all the difference in the rich, savory flavor, so I strongly suggest not skipping that ingredient. If you choose to skip out on the wine, I can not account for what that will do to the flavor of the jackfruit. I would suggest adding extra water or maybe some mushroom broth if you do decide to skip it! 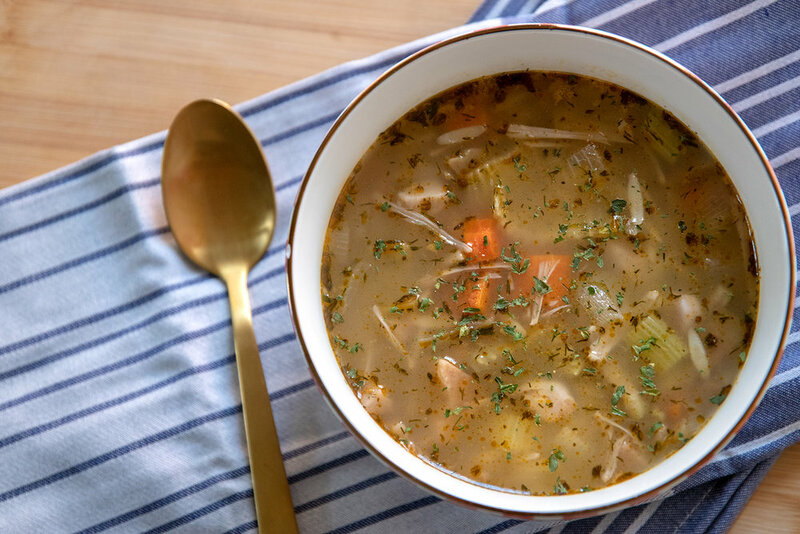 This recipe is warm, savory, delicious, comfort food that has now become a regular on our families winter dinner rotation and hopefully yours, as well! Heat a dutch oven, or another large OVEN SAFE pot, over medium heat on the stove top. Add a little oil, and the sliced onion, and cook until the onions are translucent. While the onion are cooking, drain the jackfruit, and using your fingers, shred the jackfruit apart into the pot with the onion. Add the Better than Bouillon and let the onion and jackfruit continue to cook for a few minutes to help remove the brine flavor the jackfruit tends to have. After about 5 minutes, add the water and remaining ingredients to the pot. Stir well and allow the mixture to come to a simmer. Once it is simmering, put the lid on the pot and carefully transfer it to the oven. Allow the jackfruit to cook in the oven with the lid on for about 1 hour. After an hour, remove the lid and cook for another hour, or until all the liquid has been absorbed. Check on the jackfruit and give it a stir a few times while it’s in the oven. Once all the liquid has been absorbed, carefully remove the pot from the oven and place the lid back on. Set aside while you prepare the gravy. For the gravy: In a medium deep skillet (I use my cast iron) add a few teaspoons of vegan butter over medium heat. Once the butter has melted, add the onions and garlic and sauté until translucent. Sprinkle the 3 tablespoons of flour over the onions and allow the flour to cook for a few minutes. Reduce heat to low. Whisk the Better Than Bouillon into the water and carefully pour the mixture into the pan. Add the remaining seasonings and stir well. Continue to stir the gravy until it has thickened. Place enough slices of bread on a baking sheet and top with cheese. Place in the oven until bread is toasty and cheese has melted (if you do not want cheese, just put the bread in until toasted). 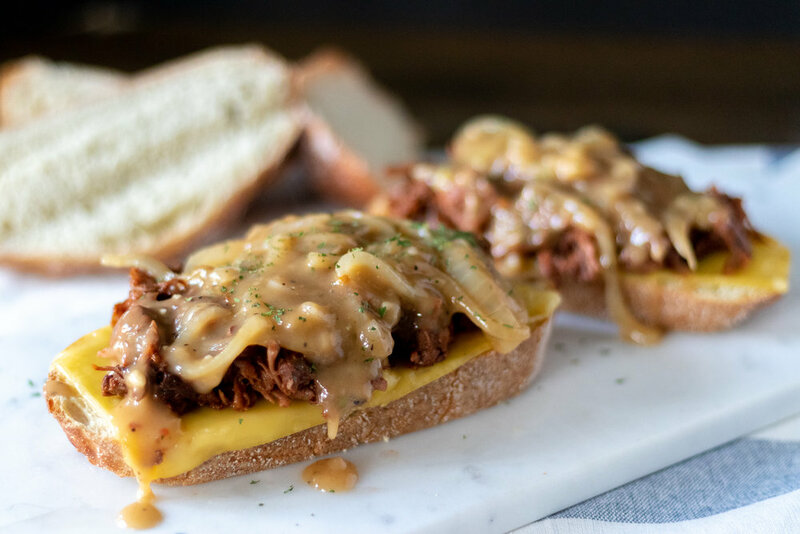 To make the sandwiches, top toasted bread with jackfruit roast “beef”and gravy. Yields 6 - 8 open faced sandwiches. Whats better than french fires? French fries piled high with jackfruit bbq, vegan cheddar cheese sauce, and tangy slaw!! I mean seriously, who doesn’t love fries, and fries that make a whole meal are even better. FOR THE BBQ JACKFRUIT; Drain both cans. Chop or shred the fruit. I find it easiest to just use my fingers to shred the jackfruit. Add the jackfruit and BBQ sauce to a crock pot on medium heat for 6 - 8 hours. You can also cook it on the stove top if you prefer. Just add jackfruit and BBQ sauce to a large pot and cook on medium/low heat for about an hour, stirring occasionally. The longer the BBQ cooks, the more flavorful and convincing it will be. I prefer the crockpot method for this reason, but it works fine to cook it on the stovetop. TO MAKE THE CHEESE SAUCE; Add all of the ingredients to a high speed blender or food processor, and blend until completely smooth. Transfer the cheese mixture to a medium pot and heat on medium/low heat, whisking continuously until the cheese begins to thicken to a queso consistency. If it gets too thick, you can add a little more water to thin it back out. For THE FRIES; Wash your potatoes and cut them into fries. Heat a few inches of oil in a deep skillet (I use a cast iron skillet) on medium heat. Once the oil is nice and hot, start adding small batches of the fries to the oil. Allow them to fry until nice and crisp, about 5 minutes. Once they are done frying, remove from oil and place on a wire cooking rack with some paper towels underneath. This will help them stay crispy while you finish frying the rest. FOR OVEN BAKING; Preheat oven to 400 degrees. Lightly coat fries in a few teaspoons of oil and place them on a cookie sheet lined with parchment paper. Make sure the fries are not over crowded. Sprinkle with salt and bake for about 15 minutes or until the fries seem crispy on one side. Take the cookie sheet out of the oven, and turn the fries with a spatula or a pair of metal tongs. Put the fries back in the oven for another 15 minutes, or until the fries seem fully crisp. FOR THE SLAW; Shred the carrot using a box grater and finely dice the onion. Add onion, carrot, and cabbage together in a bowl. In a smaller bowl combine remaining ingredients and mix well. Pour the wet mixture over the cabbage mixture and stir well. Top fries with BBQ jackfruit, cheddar sauce, and slaw to serve.